Southern author Kim Boykin will sign copies of her book, The Wisdom of Hair on Tuesday, July 23 from 4-6pm at the Barnes and Noble bookstore at 278-A Harbison Boulevard, Columbia, SC, 29212. 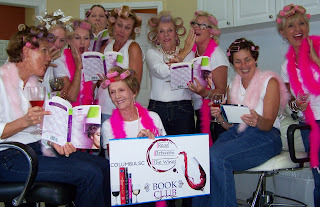 I met Kim during the 2013 South Carolina Book Festival and knew that I wanted to share her book with my book club, Read Between the Wines. Boykin is a women’s fiction author with a sassy Southern streak. 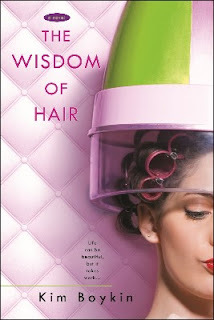 Her debut novel, The Wisdom of Hair (Penquin/Berkley Books) explores the camaraderie in beauty school and the holy connection that exists between stylists and their clients. Already compared to The Help, the novel is based on the simple observation that women innately know; they believe if they can change their hair, they can change their lives. Following her book signing, Kim will attend our book club meeting and lead the book discussion and explain the details of her Ultimate Book Club Getaway, a 4 day stay at her Isle of Palms beach house. To increase our chances of winning the getaway, our book club members recently gathered at Bedazzled Salon and Day Spa at 7421 College Street in Irmo for a salon experience photo shoot since a photo of the club is required to submit an entry.